James and I had an awesome weekend in the beautiful college town of Chapel Hill, NC this past weekend teaching PRI Integration for Fitness and Movement. The course was well represented with both attendees that never had attended a PRI course and others that were PRC/PRT certified. We had multiple states in attendance as well as sports medicine professionals from Japan, Australian, and Switzerland! Thank you all who traveled in and a special thank you to Alain Aguilar and Nina Walker and the UNC Sports Medicine Team and Ryan Holleman for Hosting! Amazing host site and our hosts’ attention to detail helped us and all the attendees was spot on to help make it an enjoyable weekend. The PRI Fitness and Movement course is a jammed packed course committed to give the industry a fresh look at core performance strategies and help professionals understand key biomechanical relationships needed to coordinate core muscles and mechanics in various symmetrical and asymmetrical movement patterns. Our coordinated mobility with the diaphragm and thoracic posture is key to understand how some of the largest and powerful muscles in our human system work. These principles help us ground our systems to sense position to load with empowered core relationships and coordinate extensor strategies to optimize compound ground based training. We want to encourage people to move often, move well, and maintain key mechanical relationships to breathe, rest, and rotate in their training. Four more host courses still available in 2017: Omaha in August, Denver in September, Minneapolis in October, and Frederick, MD in November. Ron Hruska will be presenting at the American Academy of Physiological Medicine and Dentistry (AAPMD) Annual Meeting pre-conference workshop in Puerto Rico, on September 13, 2017. The pre-conference workshop titled "A Collaborative Approach to Restoration of Airway, Posture and Breathing" will include Greg Johnson, Brad Gilden and Ron Hruska. Pharyngeal airway volume, facial-skeletal asymmetries, maxillary or mandibular retrognathic occlusion and cranio-verticality usually correspond with functional patterns of prevalent lateral vertical cervical posture, lateral biased forward cervical posture and lateral trusive mandibular passive rest position and functional activity. A review of the literature will result in very little evidence suggesting that these prevalent patterns of hemi-diaphragmatic respiration, unilateral function of the cranium, mandible and cervical complex can contribute to overall airway, oro-pharyngeal, or cranial expansion. Yet the evidence of predominance and prevalence of unilateral cervical dysfunction, thoracic curvature of the spine (scoliosis) and eye dominance as related to temporal mandibular dysfunction and pain is overwhelming. Based on his experience working directly with dentists, optometrists, podiatrists, speech therapists, audiologists, physical and occupational therapists, athletic trainers and strength and conditioning specialists over the last 27 years, he will share his observations and treatment intervention recommendations as they relate to patients who are experiencing symptoms related to predictable and prevalent integrated thoracic, cervical and cranial lateralized function and torsion. An overview of cervical position will be given as it relates to the most common patterns of the cranium and mandibular function. Guidelines implementing the dentist, physical or occupational therapist, and possibly optometrist will be provided to establish acceptable maxillary and mandibular myosseous and occlusal function. Osteopathic considerations and concepts will help support the foundation for this integrative model that is presently being implemented by many nationally and internationally Postural Restoration Institute® educated health care professionals and dentists. Myokinematic Restoration- (Beaverton Oregon) A beautiful weekend in lush green Beaverton, a southwestern suburb of Portland, one of my favorite cities. A big thank you to Isaac Coward, DPT at ATI Physical Therapy for being such a helpful and gracious host. Also thank you Tina Heiser, PT, PRC for helping me out as lab assistant once again. Its always great to have such a great colleague in attendance in an introductory course like this to assist in the lab and to help answer questions. You were great. Its so rewarding to have such a diverse group from so many different areas up and down the west coast. Thank you Mayami Oyanagi, MSPT, OCS for coming up from Los Angeles to spend the weekend with us. What's most impressive is that you just returned from traveling all the way to Boston to attend the Pelvis Restoration Course with Jesse Ham, PT, PRC and are so committed to putting it all together. You're doing a great job with things. 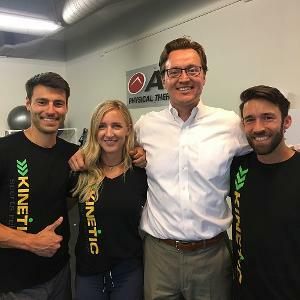 Thank you Tyler Wall, CSCS, Sarah Pfau, MS, LAT, ATC, CSCS, and Jason Butler, CSCS for following up on your PRI Integration for Fitness and Movement experience by driving down from Kinetic Sports Rehab in Seattle to take this course. I enjoyed eating Mediterranean with you guys and talking shop on Saturday evening. I think we solved a few of the world's problems together. Thank you Taylor Wade, MS, LAT, ATC for traveling up from Tucson to get insights on how to make Canyon Ranch Health Resort a better place to be. Don't forget to take my advice on the Cafe Poca Cosa. You won't regret it. Thank you John Ursone, MS, ATC, CSCS for coming up from the San Francisco Bay Area to be with us. I think this information will help you better collaborate with our friend Ryan Holleman, M.Ed., LAT, ATC, CES when he gets out west to Santa Clara University. You guys will be a great team. And a big thank you to an old friend Alex De La Paz, PT, DPT, ITPT and his brand new fiancé Kelly Lindstrom, DPT, COMT, CSCS for making sure I had what I needed to make my stay in Beaverton awesome. Congrats on the engagement and yes I think you're right Alex, Kelly is picking up on all of this a lot faster than you did. She's going to be great. Overall a super weekend with a super group of professionals. I never have enough space to mention everyone I'd like to, but know that it was great having you all there and that we appreciate the sacrifice and effort required to have you in attendance with us. During my work with Elizabeth Caughey DDS in our Integrative Postural Therapy business, we have noticed a consistent finding in many of our patients. In isolation it was interesting but when we began to juxtapose our findings with other research and with the foundational work done by James Anderson MPT, PRC we considered these findings much more important. The following white paper is a summary of those findings. Enjoy! Last weekend I had my first opportunity to speak to a group of movement professionals in the Behrakis Building at Northeastern University. Katie Delude and the team at Northeastern came highly regarded, and I learned why. Katie covered the lead role, Mike helped me with wifi codes and Kyle with integrating into the projector and sound. Thanks to the Northwestern team for pitching in! This weekend was a rather large group of folks ranging from CSCS to LMT, to ATC to PT to SPT and strength coach, so I was blessed to have high quality lab instructors during our many lab sessions--hats off to Anita Furbush PT, PRC, Michael Mullin ATC, PTA, PRC and Donna Behr, DPT, PRC for giving us 'numbas' as instructors during lab. Great focus from both the class and the PRC instructors during lab time! This weekend we discussed the inlet and outlet of the pelvis from many perspectives, the engineer and the welder perspectives in particular, as both have merit. "Best to be both" as contemporary movement science is concerned in relation to application integration of inlet and outlet position, stability and dynamic functional ability. Thank you Benjamin Abbott, Sam Hammer, Edilio Flores, Payal Patel, Meghan Johnson, Adam "Slippery" Babcock, Katelyn Yerardi among others for their volunteering during various different components of lab time. Being able to watch and sense the course material makes the whole experience notably more effective on several fronts. To Michael Camporini, Joseph Erdos, Lori Rose and many others, thank you for your engaging, timely questions about varying components of the course as we covered rich content. A lively group of engaging and passionate movement professionals made last weekend in Beantown at Northeastern noteworthy. High quality across the board!